CALEDONIA, Ohio — River Valley students and faculty hosted a Veterans Day Nov. 13, starting with coffee provided by the River Valley FFA. Once all the Veterans have arrived, the entire staff and student body join in a standing ovation to honor their service. Through the direction of the River Valley FFA officer team, the group recited the pledge of allegiance and the choir presented the National Anthem. Each veteran walked across the stage to receive a medal, in honor of their service. The assembly included musical selections performed by the band, orchestra and choir. Following a buffet style lunch, the Veterans visited classes to talk to the students about their experiences. On Nov. 10 and 11, members of the River Valley FFA helped set up the Christmas by Candle Light event held at the Marion County Fairgrounds. The drive-through show is open Thursday, Friday, Saturday and Sunday nights through Dec. 9, then every night Dec. 13-25, from 6-10 p.m.
WEST SALEM, Ohio — Northwestern FFA members traveled to Indianapolis for the National FFA Convention, joining members from West Holmes, Licking Valley and Smithville chapters on a charter bus. 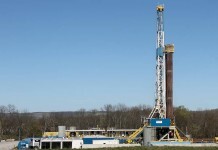 The trip included a stop in Newport, Kentucky, where the group dined on a riverboat, saw the sights of the Ohio River, and participated in line dances. The next day, the members toured University of Kentucky College of Agriculture, Food and Environment, and toured the meats lab and ag campus. After the visit, they traveled to Churchill Downs. That evening, members attended the first general session of the 91st National FFA Convention. After the speaker, members saw Garth Brooks in concert. On Thursday morning, members toured Caito Foods, a produce distributor to major stores. The members then went to the Indianapolis Motor Speedway to tour the track and museum. After the tour, the group attended the National FFA Career and Business Expo. On Friday, members visited Fort Harrison State Park where they took a tour on horseback, and later attended the sixth and seventh general sessions. On Saturday, the members attended the eighth general session, where two Northwestern FFA Members received their American FFA Degrees: Katie Stull, daughter of Brad and Molly Stull, and Riley Murphy, daughter of Cheryl and Nathan Murphy. CRESTON, Ohio — The annual Veterans Day breakfast and assembly was held at Norwayne High School Nov. 9. The Norwayne FFA put on a breakfast, which was a good way to socialize with the veterans. Following the breakfast, the Norwayne National Honors Society coordinated the assembly, which included a slide show, a speech from a veteran, the National Anthem and Taps. MILLERSBURG, Ohio — On Nov. 13, a West Holmes FFA team participated in the district food science contest at Lucas High School. Members participating included: Taylor Feikert, Lexi Ogi, Kylie Ramirez, Maddie Stitzlein, Natasha Averbukh, Destiney Pozworski and Ethan Feikert. COLUMBUS — The Ohio FFA Foundation recently announced it would be awarding the symbolic FFA jackets to first-year members. Sarah Hoak of the Plymouth FFA Chapter was awarded a jacket. Students from across Ohio applied to receive the jackets as part of the Blue Jackets program, sponsored by Beck’s Hybrids and the Ohio FFA Foundation. With the support of individuals and the Beck’s Hybrids dealer network, 107 FFA jackets were awarded this year to Ohio FFA members. UTICA, Ohio — On Nov. 11, the Utica FFA held its 29th annual toy show and pancake breakfast. This year’s show drew 25 vendors and over 400 visitors, making record attendance. On Nov. 12, nine members attended the District Food Science CDE at Zane Trace high school and qualified for the state competition in December. The Utica FFA chapter placed second out of 14 teams. Individually, Trina Orr placed fourth, Aramaik Wright placed fifth, Seth Blake placed 13th and Kimberlee Hornyak placed 23rd. Also competing were Georgia Gamble, Montanna Moran, Bella Ellis, Lindsay Gray and Melodie Woodruff. Orr, Wright, Blake and Hornyak will be representing the chapter at the state contest Dec. 1 at the Ohio State University. VINCENT, Ohio — Twenty Warren FFA members traveled with Waterford FFA to a men’s hockey game on Nov. 16 at Ohio State University. Members got to see OSU beat Wisconsin, 4-0. The chapter also got to see Ohio State university’s football stadium. SULLIVAN, Ohio — On Nov. 1, members from the Black River FFA chapter attended the annual Black River/Mapleton Farm Games event at Mapleton High School. Members from both chapters participated in activities that encouraged fellow FFA members to use team working and leadership skills. In addition, to the leadership activities, members also participated in a variety of games, such as FFA Creed knowledge, ring the ear of corn, wheelbarrow/feed sack race, pepper eating contest and the bale pull, and took home the gold. RAVENSWOOD, W.Va. — Ben Smith from Ravenswood, W.Va., was selected as a national winner for the National FFA Proficiency Award in Grain Entrepreneurship. Smith was one of only four people chosen to compete for this award at the national finals at the 91st National FFA Convention in Indianapolis earlier this fall. Smith, of the Ravenswood FFA Chapter, started his operation with six acres and had 60 acres last year. He harvests his corn with a Gleaner K2 combine that he purchased several years ago. In 2015, he had 185 bushels per acre but has increased to 200 bushels per acre last year. Smith sells his sacked, shelled corn to deer hunters in the area. 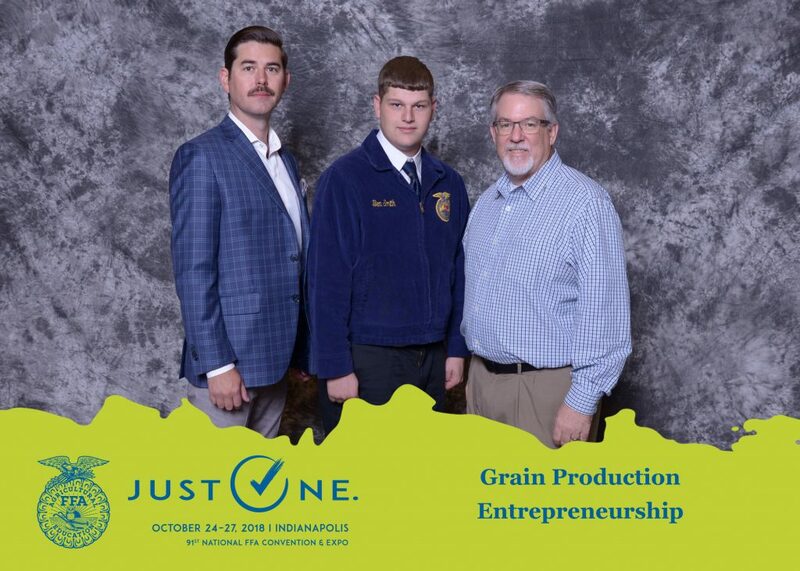 Currently a student at Ohio State ATI in crop management, Smith is the first student in the state to receive this award in grain entrepreneurship. 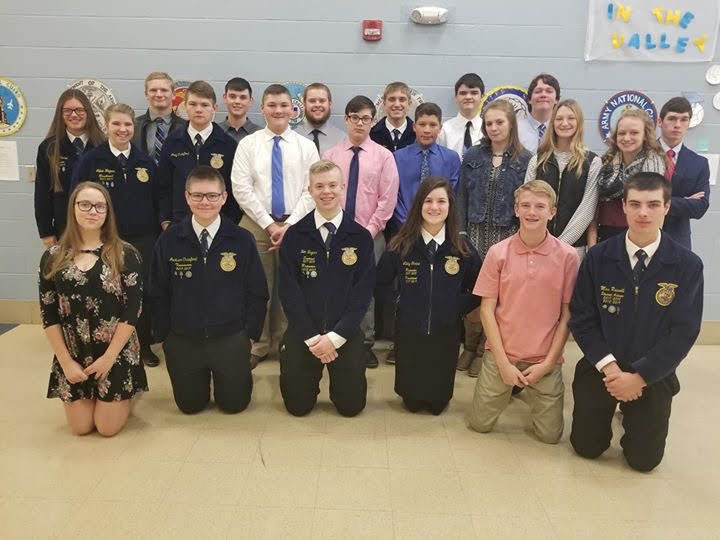 LOUDONVILLE, Ohio — Loudonville FFA members attended the National FFA Convention earlier this fall in Indianapolis. Members traveled on a charter bus along with Black River, River View, and Buckeye (Medina) FFA chapters. The group spent the first day touring Valero Ethanol Plant and S T Genetics Heifer Lot. On the second day, the group went to the trade show, and also attended the first session and a Garth Brooks concert. On Thursday, they toured a chocolate factory tour and attended the second general session. To end the day, they went to a rodeo and met up with other Ohio FFA members at Buckeye Bash. On Friday, members toured an equine specialty hospital and visited the Indiana Grand ( a horse race track) where they ate lunch, watched several races, were given one-on-one explanations of the industry, and got a picture with the winning horse. On Saturday, they attended the American Degree Ceremony and returned home. On Nov. 12, the Loudonville FFA honored the area veterans. They started the day with a pancake breakfast for all senior citizens and veterans. The FFA chapter officers also coordinated the high school Veterans Day Assembly. Holly McClay, the State FFA Vice President, gave a speech and Corporal Josh Hahn, USMC, was the keynote speaker. Josh Book told the group about Irving Eugene Peters and the new memorial highway signs in his honor. He was a veteran of WWII and a POW. After the program, FFA members served the senior citizens and veterans a soup lunch. 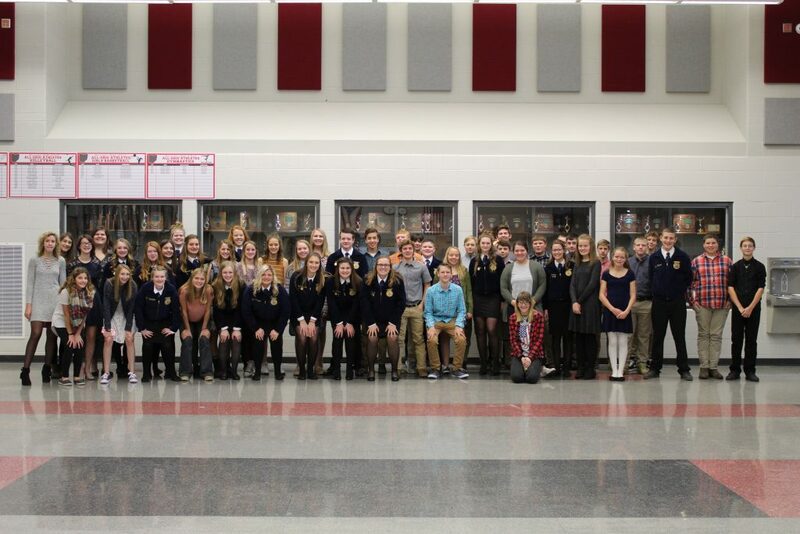 On Nov. 13, food science team members competed at Lucas High School for District 2 competition. Team members included: Leah Carnegie, Madalyn Sponsler, Mya Switzer, and Grant Portz, who placed fifth overall in the contest. The team earned fourth place in the district. Sophomore, Brenna Koch, recently placed seventh in the District 2 FFA Job Interview CDE competition, sophomore division, tying for first in the interview portion.